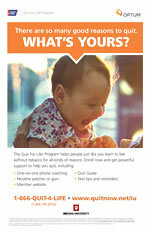 To enroll in Quit For Life, call 1-866-784-8454 or visit the Quit For Life Program website. IU employee medical plans cover 100 percent of the cost of tobacco cessation prescription and over-the-counter tobacco replacement products. Coverage is limited to a 180-day supply per covered individual per year. Covered prescriptions drugs include Chantix, Zyban (bupropion), and Nicotrol. Over-the-counter products require a prescription in order to be covered under the employee’s medical plan.